2. Open a pack of cherry flavored Pop Rocks candy and spread on a small plate or napkin. Press rim of the glass into the candy to coat rim. 3. In a shaker filled with ice, add cranberry vodka, shake and strain into prepared glass. 5. Add a small splash of lemon/lime soda. By Joe Perdicaro at Zebra Bistro and Wine Bar, Medfield, Ma. 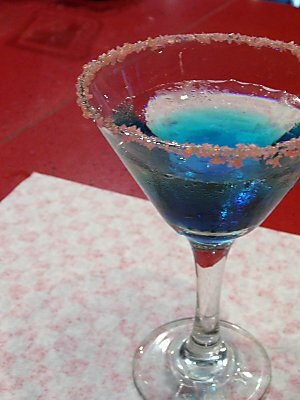 Shake and strain into a chilled martini glass rimmed with honey and Pop Rocks. Coating the rim with honey seems to make more sense, as I think the lime would make the Rocks dissolve more quickly, thus taking away from the explosive enjoyment. Either way, both sound delicious.